Fintech is a term used to describe the companies operating in the financial technology sector. It relates mainly to small start-up companies which develop innovative technological solutions in such areas as online and mobile payments, big data, alternative finance and financial management. A good overview of Fintech with a B2C focus, including market size, business models, consumer views, blockchain technology and company profiles can be found in our Statista Report 2017. As of February 2015, bank spending on new technologies in North America was projected to reach 17 billion U.S. dollars in 2015 and increase to 19.9 billion in 2017. Investment into the Fintech sector has grown in significance in recent years. On a global scale, the value of investment in Fintech companies amounted to approximately 31.4 billion U.S. dollars in 2017, down from its peak of 47 billion U.S. dollars in 2015. The annual value of global venture capital investment in Fintech companies is increasing. The global growth of Fintech is dependent on its growth in individual markets, which differs greatly. As of August 2018, the Americas was the most popular location for Fintech startups. 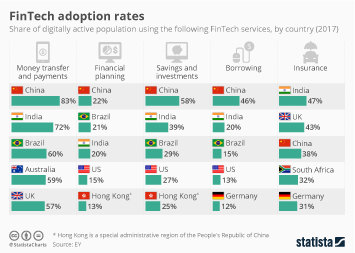 However, Fintech adoption rates in various financial sectors such as savings and investments and borrowing show that the U.S. consumers often lag behind consumers in other countries such as China, India and Brazil. An overview of the U.S. Fintech companies can be found in our Statista Report 2017. Surprisingly, only 14 percent of Americans have heard about Fintech companies, and have a clear idea of them.